Contrary to popular belief, Black Lightning is not DC’s original Black superhero; arguably, those accolades go to Mal Duncan (Vox/Hornblower/Guardian) and John Stewart (Green Lantern). However, he is DC’s first superhero aimed at a Black audience and dealing with what were seen as Black realities. Like almost all Black superheroes, he started out with a decidedly “street” level of crime fighting, and his initial run of comics numbered only 11 issues before it was caught up in the 1978 DC Implosion that saw dozens of titles axed. As a character, he’s a combination of a number of hero traits used heavily by DC. His athleticism is explained by him being a gold medal winning Olympic decathlete. He’s highly educated, but not to the level or degree of Mr. Terrific or Batman. He has metahuman powers, but they sit in the middle tier of the DC hero continuum. His most active period was pre-New 52, which saw him as part of the Outsiders and eventually the Justice League, and briefly as the Secretary of Education in the USA, building off of his background as an educator and high school principal. Post New-52 has seen him more or less ignored in the comics, with sporadic appearances but nothing solid until the recent start of the “Cold Dead Hands” series. Interestingly, aside from being a mature character, Black Lightning also has two daughters and unlike so many others in comics, has been a successful single father. He still has a good relationship with his ex-wife, Lynn Stewart, who divorced him over the stress of living with an active superhero. His daughters are metahumans as well. His eldest daughter, Anissa Pierce, Thunder, can manipulate her own density; and Jennifer, his youngest, functionally is her superhero name, Lightning. In addition to dealing with issues around race and the realities of being Black in America, Black Lightning has also dealt with other issues as well. The most notable of which is sexuality. Thunder, his daughter, is canonically a lesbian in the pre-New 52 universe, and enters into a relationship with bisexual Amazon Grace Choi while fighting alongside her in the Outsiders. This was a pivotal moment in Jefferson Pierce’s character development as well, as he had to reconcile his more “traditional” ideas around sexuality with his love of his daughter and desire for her to be happy. Black Lightning has been on the radar for a while now, and I won’t lie, I had reservations coming into it. Netflix’s Luke Cage series set a very high bar for Black superhero shows, and Marvel has been beating its “We care about Black people, look, it’s Black Panther!” drum since Avengers: Civil War came out. The CW has a solid track record of producing successful DC adaptations, but their first seasons haven’t always been solid. Black Lightning may have broken that trend. The casting in this show is absolutely on point. Cress Williams kills it as Jefferson Pierce, ex-superhero, 50 something dad trying to do the best he can for his daughters and students in the reality that too many Black Americans deal with day to day. Nafessa Williams and China McClain, as his daughters Anissa and Jennifer, are similarly on point, capturing the spirit of the various incarnations of their characters. Christine Adams, playing his wife, Lynn Stewart, brought great chemistry to the scene; it’s obvious they still care deeply for each other, but equally obvious that the stress of superhero life is a weight that isn’t easily thrown off. On the villain side, Marvin Jones III is positively malevolent as Tobias Whale, Black Lightning’s oldest and most dangerous enemy. The 100 make a great appearance as a credible threat to not only Black Lightning, but to the larger community. As far as setting up the situation, it’s top notch work. James Remar and Damon Gupton round out the regular cast as supporting characters that add complexity to the life of Black Lightning. Damon Gupton’s Inspector Henderson rose through the police ranks hunting Black Lightning, and is also a near and dear friend to Jefferson Pierce. James Remar’s Peter Gambi is a tailor, with a knack for superhero outfits; he’s one of Jefferson’s oldest friends, and a true believer in the value of superheroes. I was concerned when I heard the barebones story idea, since it sounded too well trod. Gang violence increases, threat to family, hero comes out of retirement, people celebrate. While that is the plot in the broadest of strokes, there’s more to it than that. The world built for this series is unrelently based on real world issues that were well translated into a comic-book context. Tobias Whale thinks Black Lightning is dead, and that he killed him. Jefferson Pierce has been hiding out for the last ten years, not using his powers; but instead using his charisma and force of character to establish a detente between the gangs of the area to make sure his school is free of their influences. Truthfully, while it upsets him, he accepts the escalating violence and turmoil around him as he’s created an eye in the storm where he can give kids the best chance they can have to enjoy a bright future. The thing is though, is that eventually, the storm moves. Jennifer, the more rebellious daughter, lies about her age to get into Club 100, where a local gang member decides to hit on her after she smokes some weed; it doesn’t work, but his problems become hers when his boss, “La La” Latavious, calls him to the mat for debts and tries to force her into prostitution. Already in a bad mood from a racial profiling the night before, Jefferson finally loses patience with trying to do things the “right way”, and uses his powers to orchestrate Jennifer’s escape. This event sets the ball rolling for his return to vigilante superheroing. After being rebuffed in front of the school, said gang member comes back later and kidnaps Anissa and Jennifer, prompting a police response that isn’t fast enough to satisfy Jefferson. With his ex-wife’s unspoken blessing, he heads to Gambi’s to get his suit, only to find that the old tailor has been working on a new and improved one. Fast forward to the Seahorse Motel, and La La is losing it about his underling making a move like that without permission, especially since he just made a deal with Jefferson to keep his gang away from the girls. Black Lighting makes his move and decimates the gang there, rescuing his daughters and causing enough rukus to summon the police immediately. The show ends on two plot development points. The first is with Tobias Whale, who is more than a bit upset with the sudden appearance of a “new” Black Lightning. The other is the stress induced manifestation of Anissa’s powers as she breaks a sink and then stands there staring at her hands with more than a bit of fear and confusion. As far as pilot episodes go, this show killed it. Strong performances, tight writing, good music, and a willingness to take on social issues made it all work. There were some areas for improvement. Cress Williams is a bit stiff as a fighter, and the fight choreography was a bit underdone. Also, the “lightning” effects need some work as well, it felt a bit slow moving. But aside from those relatively minor points, it’s a whole lot of “carry on”. It’s an entirely fair comparison to say that right now, this show can stand toe to toe with Luke Cage. One point I’d like to bring up in closing is that this show doesn’t pull punches about issues. One of the best lines was by a character on an in-show newscast, who asked “Why is it that other communities can have people with powers, and they call them heroes, but when we have one, they’re a dangerous vigilante?” (I’m paraphrasing this). The point being that racism colours perception, and that if Black Lightning were white and in a white neighbourhood, he’d be lauded as an upstanding hero and citizen instead of being hunted. The real world inspired racial profiling scene when Jefferson is pulled over might be enough to trigger people in its harsh reality. 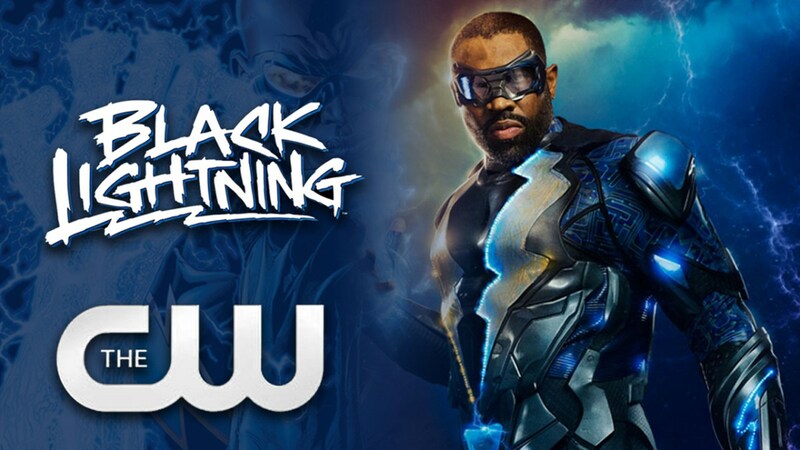 So, now Black Lightning is going to be a regular part of my weekly TV schedule, and I recommend it highly. Images used in this post are property of The CW and DC, and are used here for review puposes only.